By the grace of this sacrament, the individual receives peace and courage to endure, unity with Christ and the whole church, forgiveness of sins, restoration of health if for salvation and preparation for passing over into eternal life if it is God’s will. Anointing of the sick reminds us that the Lord’s compassion is endless. 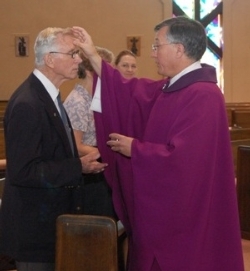 Those in need of the Sacrament of Anointing should contact the Parish Office at (949) 494-9701. Anointing of the Sick is celebrated on the third Saturday of each month after the 8:00 AM Mass. Anointing the forehead he says: "Through this Holy anointing, may the Lord in His love and mercy help you with the grace of the Holy Spirit." Anointing the hands saying: "May the Lord who frees you from sin save you and raise you up."